Website visitor Dan Taylor wrote to ask that I scan and post this article, which appeared in the 1962 Annual edition of American Modeler magazine, on making fiberglass cowls. It is a variation on vacuum bagging that exploits the even tension applied by the elasticity of a rubber balloon. Although limited to relatively small forms, it has the advantage of low cost and complexity, and it eliminates the potential nuisance of the mold release agent not being fully coated and causing separation issues. This method will probably not work too well with shapes that need localized indented areas more than 1/32" to maybe 1/16" deep (like cooling fins). The article did not originally make direct reference to the numbered photos, so I added them as best as I could guess based on the text. 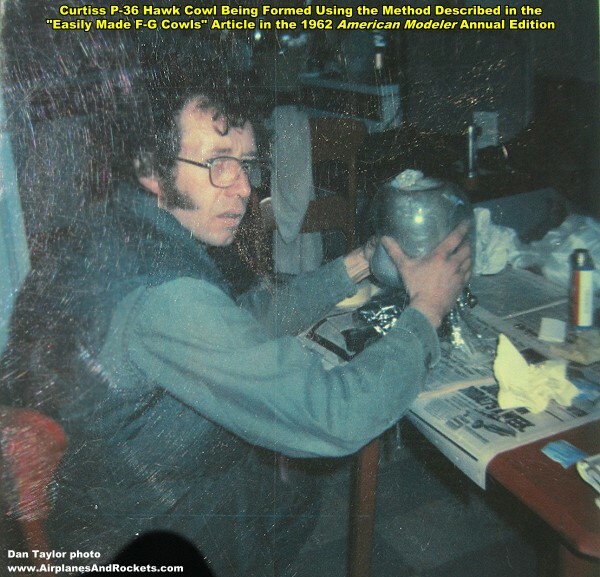 If you use this method of making a fiberglass cowl, please send a photo of your work and I'll be glad to post it here. 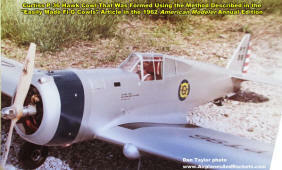 Here is Dan Taylor using this very method back in the last century to make a fiberglass cowl for his Curtiss P-36 Hawk! When fiberglass first became available as a model construction material I tried an engine cowl using a male mold. The result was not too good because the natural resiliency of the glass cloth made it spring away from the mold. I tried again using a female mold and had better luck, but still had to use too much resin to fill the loose layers of cloth. 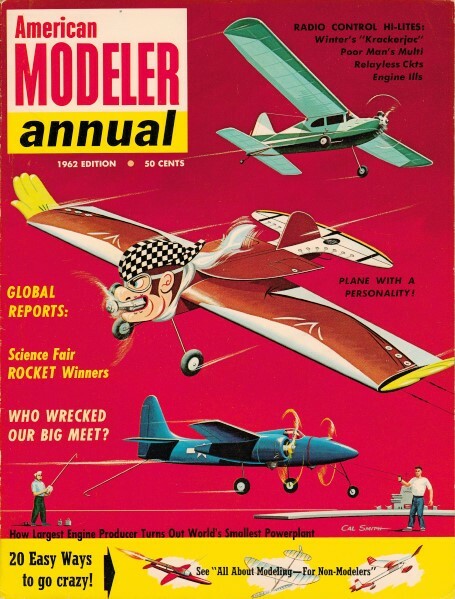 Then I remembered that many years ago Lockheed had used a rubber bag to force wooden laminations into a concrete mold. I tried inflating a balloon inside my mold after I had laid in the glass cloth and found I had the answer. 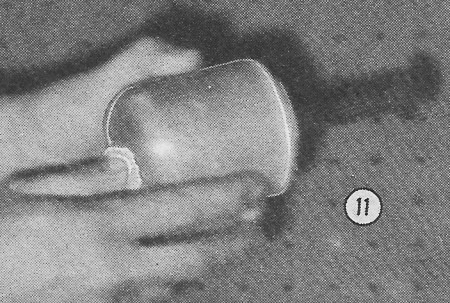 The pressure of the air-filled balloon forced the glass fabric tightly together and forced out all excess resin, which gave a cowl with a minimum of weight-adding resin. This still left the work of making the sample cowl, casting this in plaster and the use of parting agents. I had noticed that my balloon pulled away from the hardened resin easily and finally arrived at the present process which has proved successful for seven years. The master mold may be made from any convenient material (balsa, hardwood, soap, plaster). This mold should be made 3/64" smaller than the desired outside dimensions of your finished cowl. If round in cross section, it may be turned on a lathe. Using a lag bolt as mounting, I have made many "masters" under three inches in diameter by chucking a long 1/8" wood screw in a hand grinder. If the cowl is elliptical in cross-section it will be necessary to hand-carve the master. The openings in the front of all of these cowls should be recessed approximately 1/8". Mount the cowl (small end up) on some convenient post as shown in photo #1. 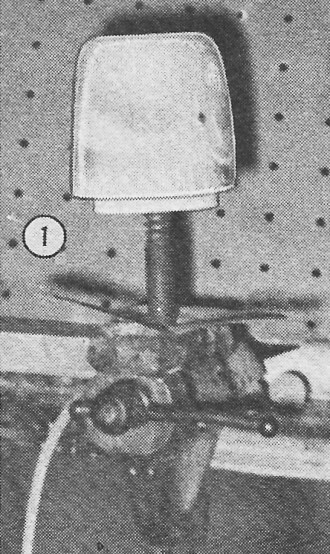 If this post is to be held in a vise, slip a piece of cardboard on the post to prevent resin from dripping into the tension screw. A block of wood will do if you do not have a vise. Balloons of synthetic rubber which can be inflated to at least 12" diameter can be purchased at toy or novelty stores. Two balloons will be needed for each cowl, and a few spares are a good idea. 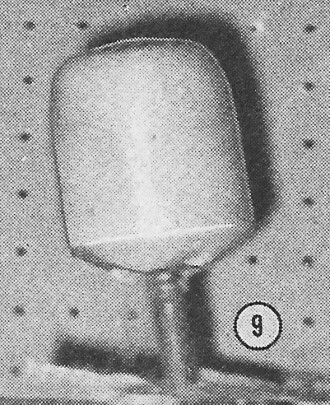 Drop from eight to twelve inches of carpet thread or light string into the open end of the balloon with at least three inches folded over outside. 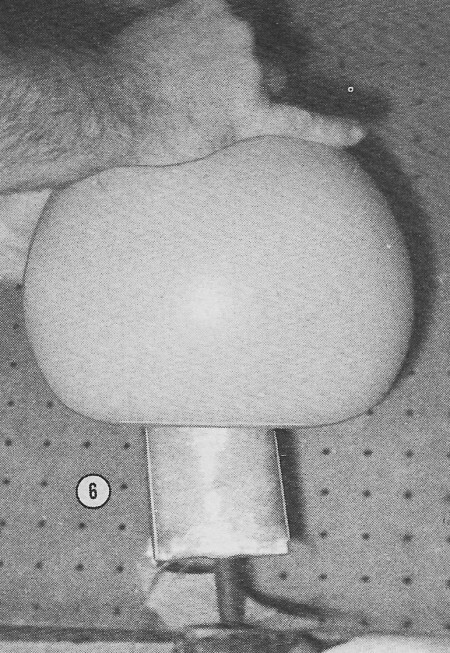 Inflate the balloon fully and press down onto the mold forcing the balloon to double inside itself (#3). 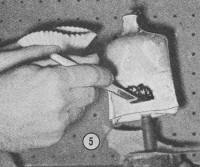 The thread inside the balloon should fall down the side of the mold between the two layers of rubber. 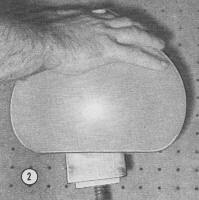 Gradually valve out the air as the balloon is pressed down until your hands touch the top of the mold. This will seal the opening in the balloon. Slide your hands down the side of the mold, forcing the bulged section ahead of your hands, until at least two inches of air-filled bulge extends past the bottom of the mold. Squeeze this excess under the bottom of the mold until the trapped air escapes through the passageway formed by the thread (sketch). When all air has escaped, pull out the thread (#4). Fiberglass kits available in hobby shops include a satisfactory glass cloth, or a heavier grade may be purchased in a boat shop. Pull off several strands of glass from the cut edge and put to one side. Cut a piece of the cloth two inches wider than the length of the finished cowl and long enough to circle the cowl four times, in the case of the fine kit cloth (two layers of the boat cloth). Wrap this around the mold and hold in place with the extra strands mentioned above. Slit cloth every 1/2" at nose of cowl to prevent folds in areas of sharp curvature. Be careful not to puncture balloon with scissors. I mix my resin in the proportion of 15 drops of hardener to each ounce of resin. 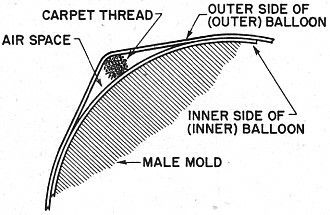 Start brushing inner layer of cloth down to the mold and work outward along the spiral of cloth layers (#5). Then coat rest of cloth, using plenty of resin in order to wet it through to the mold. 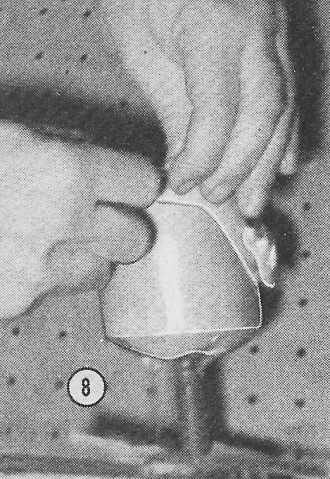 Permit the resin to harden for two hours and then peel off the outer balloon (#8). 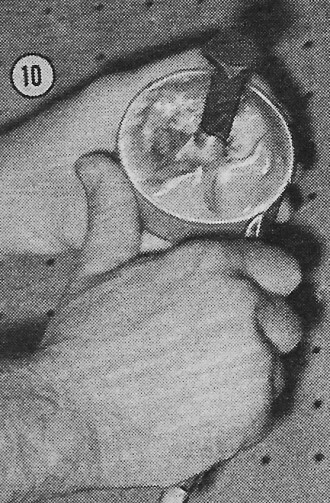 The resin at this point will be rather sticky (#9), and it is a good idea to rub baby powder on your fingers before cutting off excess fiberglass at rear of cowl (#10). Cut a rough hole at front of cowl (no larger than finished cowl opening). Put a steady pressure on the mold through this opening (#11) and the inner layers of rubber will slide and permit the mold to be ejected (#12). The shell is left overnight to harden completely. 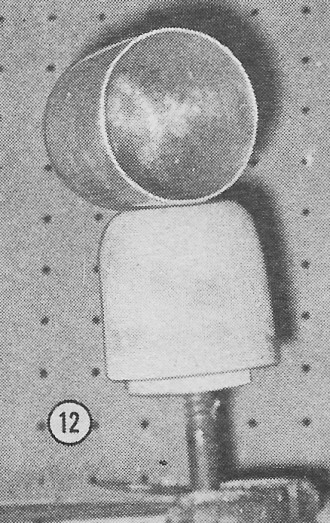 The pressure of the outer balloon will have forced the cloth into the front recess of the mold far enough to show a clear outline of its shape inside the cowl. I use a jeweler's saw to cut the full size opening. 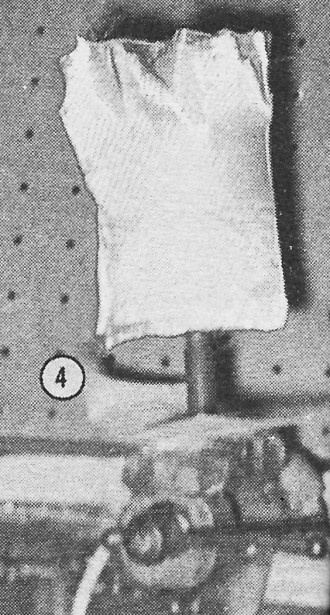 It will be seen that the lapped glass fabric has built up the cowl thickness in front. This should be thinned out with a file or coarse sandpaper and the entire surface sanded to form a base for painting. Note: the glass fibres are very irritating to the skin and eyes. Roll down your sleeves, and first let some soap dry on your hands. Do all sanding outdoors so that the wind will blow the dust away from you.